This article is about the Forerunner shield world. For other uses, see Requiem (disambiguation). "The scale and brilliance of the Didact's strategic plan now appears more like the tomb of all hope—certainly of all my hopes. A dream we had both shared is little more than a repository for a Promethean long since chewed up and cast aside by history, by force of his enemies, human and Forerunner—and by the dire influence of the Flood. And yet, this enormous construct, nothing less than a completely artificial world, this bastion designed for endless war, still impresses in a way that a Halo cannot." Requiem, formally designated by its Forerunner creators as Shield World 0001, was a Forerunner shield world located in the Epoloch system. It once served as the central base of operations for the Prometheans, an elite class of Warrior-Servants, for thousands of years until the end of the Forerunner-Flood war. It remained sealed off for a hundred millennia since the end of the war, and became the site of major events as UNSC and Jul 'Mdama's Covenant forces stumbled upon it in 2557. The UNSC Infinity returned to Requiem in early 2558, resulting in a protracted battle between the UNSC and the occupying Promethean-Jul's Covenant alliance. Requiem itself was destroyed at the conclusion of this campaign by Jul 'Mdama. The Didact and the Librarian in Requiem's war room. Built as the template for the Didact's shield world defensive strategy, Requiem was constructed long before the human-Forerunner wars to serve as a fortress world for the Warrior-Servants' Promethean class. As with the shield worlds which would follow, Requiem's true capabilities were kept as secret as possible from the other rates; although its components were constructed by the Builders, the process was compartmentalized in a way that only the Prometheans would be fully informed of its ultimate configuration. Requiem was a central hub for all Forerunner forces and war efforts for thousands of years, from the conflict with ancient humanity to the end of the Forerunner-Flood war. Upon his recovery from the clutches of the Gravemind near the end of the conflict with the Flood, the now mentally unstable Ur-Didact returned and reassumed control of Requiem. In his vision, Requiem was to serve as a core of a new era of prosperity and power to the Forerunners through the defeat of the Flood and the subjugation of all their enemies. To this end, the Didact used the Composer to convert his loyal Warrior-Servants into powerful robotic Knights. Despite his grand plans, relatively few of his Warriors joined him: in addition to the Didact's flagship, Mantle's Approach, only one Fortress-class vessel, several dreadnoughts and scrapped Builder vessels were present at Requiem during the endgame of the war. After the Ur-Didact used the Composer to enslave Omega Halo's human population to use them to create more of his Knight constructs, the Librarian imprisoned the Didact in a Cryptum in the core of the shield world to stop him. The Librarian uploaded a personality impression of herself within Requiem's systems, placing the Janus Key in the possession of this imprint. The Librarian then departed Requiem and sealed the shield world off for the next 100,000 years. UNSC ships entering Requiem via an access portal. In 2554, Jul 'Mdama and his Covenant discovered Requiem, using coordinates provided by Forerunner symbols. Over the next three years, his Covenant tried to enter the planet, without success. On July 21, 2557, the severed aft section of the UNSC frigate Forward Unto Dawn, containing John-117 and Cortana, drifted near Requiem and were forcibly pulled inside an automated entrance portal on its surface, along with a number of ships from a Covenant remnant fleet and later, the prototype starship UNSC Infinity. Inside, they encountered hostile Promethean forces that occupied the structure, and unwittingly released the Didact. The humans battled their way through the world, destroying its gravity well generator so the Infinity could escape. The Infinity escaped from the shield world, and despite the best efforts of the Master Chief and Cortana, the Didact escaped as well to go after the Composer, chased by the two in a Lich. Six months later, the Infinity returned to Requiem in order to establish research facilities to study the installation, facing both the local Prometheans and Jul's Covenant forces which still occupied the structure. "We have what we came for. Initiate the evacuation. Whoever does not make it to a ship will die with Requiem." UNSC Infinity fleeing the flare emitted immediately after Requiem's collision with Epoloch. In February 2558 Jul 'Mdama, believing to have obtained the artifact they sought, implemented a local Flood containment protocol, placing Requiem on a collision course with its parent star, Epoloch. With the Infinity anchored to the planet via a slipspace conduit generated by a Forerunner artifact on board, Fireteams Majestic and Crimson were sent to deactivate two artifacts on Requiem that kept the ship anchored, while Henry Glassman deactivated the third one aboard the Infinity. After many complications, both fireteams reached their objective and the Infinity was able to flee the planet, seconds before Requiem was consumed by the sun, which went supernova immediately afterward due to a total failure of local plasma shell maintenance systems as well as Requiem's containment measures. Cortana observing the core of Requiem. The most resilient shield installation built by the Forerunners, Requiem consisted of multiple concentric planetary shells enclosed within one another, sealed inside an enormous outer shell. The outermost surface was an armored covering enveloping the second shell, which was oriented like that of a planet and housed the world's primary terrestrial environment. Requiem's core was located below this planetary surface, and had a surface reverse to that of the terrestrial exterior, similar to a miniaturized Dyson shell. Requiem's outer surface was a thick metallic shell lacking a terraformed surface and covered in patterns and layers of machinery and overlapping armor plating hundreds of kilometers thick; the first 50 kilometers were to feature weapon emplacements by the thousands, but these plans were never realized due to the Didact's exile. The surface was also covered in a number of lights; some of these formations took on geometric patterns, such as circular orientations or arrays of lines. Amongst its complement of luminous formations were two enormous symbols; the Eld, (which represents the Mantle), as well as the Reclaimer glyph. Unlike some shield worlds constructed later on, Requiem did evidently not possess shielding against the effects of the Halo Array; the Didact was only protected by the slipspace bubble generated by his Cryptum. The interior of the facility was unique relative to the other known shield worlds; rather than housing an artificial star at its center, surrounded by a habitable inner surface, the exterior shell housed additional layered shells, the outermost of which had an environment resembling a terrestrial planet. Another important feature was that immediately above the cloud layer of the protected second layer, the interior surface of the protective shell was visible. This was demonstrated by the sky being dominated by the machinery above it, with large, vertical structures reaching down to the surface below. Numerous small artificial stars provided illumination for Requiem's interior. The innermost miniature Dyson shell housed the core of Requiem, which was where the Didact's Cryptum was situated. The platform which housed the Cryptum was suspended in the very center of the sphere and was protected by a shield emitted by two adjacent pylons located on opposing sides on the surface of the inner sphere. Two enormous energy conduits perpendicular to one another ran between the pylons across the entire inner surface. The surface in the inner shell mostly consisted of rocky desert landscape dense with prominent arrangements of light indicating the presence of large-scale structures. A readily seen feature of this construct is that it harbored a number of large circular entrance portals, with iris-type opening mechanisms. When opened, a vibrant, blue-white light could be seen emanating from the interior. These portals featured the ability to generate artificial gravity well, drawing in objects in the immediate vicinity if the presence of Reclaimer is detected. These gravity wells were powered by generator complexes situated somewhere on the inner planetary shell. The next known aspect of this facility is that it possessed fully active and functioning technology, unlike other Forerunner sites, which have largely been abandoned and dormant, with the exception of Shield World 006. Examples of such active technology included enormous spires suspended in the air without visible support and structures capable of shifting and reconfiguring themselves, extensive use of sophisticated hard light construction to create structural elements, or the Prometheans' various weapon and equipment caches found across the shield world. Designed to wage continuous war for eons if necessary, Requiem was completely self-sustaining. It was orbited by seven captured planetoids, covered in ice, which could be strip-mined for resources, allowing its occupants to survive and carry out their campaigns potentially for millions of years. Like most Forerunner technology, Requiem drew its power from vacuum energy, with pylons across the structure tapping into numerous nascent alternate universes and draining them of energy. Large regions of the terrestrial interior were kept dormant, with the landscape covered in mineral-rich ice, to be melted down to create more refuges for Forerunners and other species in the event of an extended campaign. For travel between the layers and various locations, Requiem used teleportation portals that could transport anyone who used them to different locations on the shield world. Due to her experience and expertise with Forerunner technology, the AI Cortana was capable of controlling these portals. The Prometheans that occupied Requiem were capable of generating portals and translocating across the shield world. "Requiem needed to be impactful; it needed to take the player back to the epic mystery and nostalgia of exploring the first Halo video game a decade ago. Making weird and alien spaces is not terribly challenging. Keeping them from falling into abstraction or failing to be believable is. Keeping the player invested and finding those keys to keeping him or her immersed was our goal." A requiem is a Catholic mass dedicated to the souls of the deceased, often celebrated at funerals. "Requiem" comes from the Latin word requiem, which means rest (A reference to the Ur-Didact). Prior to Halo 4, Requiem was known among fans as the Legendary Planet, referring to the planet's first appearance in Halo 3's Legendary difficulty-exclusive ending. Requiem also appears in a small image in the Halo Encyclopedia, where it is shown to have a reddish-orange color on a small illuminated section. The planet appears again in the Halo 4 announcement trailer, where the aft half of the Forward Unto Dawn is seen being pulled into a massive, iris-like opening on its surface. 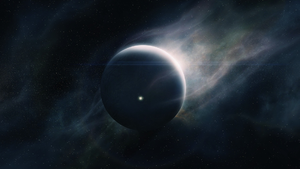 The planet was finally identified as "Requiem" in the May 2012 issue of the GameInformer magazine. An image of Requiem is used to advertise an in-universe film titled Dark Planetoid Rising on the UNSC Pillar of Autumn's bulletin board in Halo: Combat Evolved Anniversary. According to Brian Reed, the lead writer of Spartan Ops, Requiem is the largest Forerunner construct in history, though this is far from accurate: With a diameter of 10,787 kilometers, Requiem is dwarfed by several Forerunner constructs, such as the Capital (~ 100,000 km), Installation 00 (127,530 km), and especially Shield World 006 (~ 300,000,000 km). Early concept art for Halo 4 display a decidedly different concept for Requiem's entry portal than the final incarnation. Whereas in the game the entrance opens directly to the inner planetary shell underneath, several works of concept art depict the interior of the opening as a cavernous, structured space which appears to lack gravity. Requiem is designated as "43121124" by the holographic terminal displaying the Dawn's predicted drift course. Requiem being pulled into its star was originally suggested as a joke by Frank O'Connor during a brainstorming session on the ending of the first season of Spartan Ops. Halo 4: The Essential Visual Guide and the shield world's in-game appearance in Halo 4 seem to indicate that Requiem has only one entry portal, referred to as the "maw corridor" in the visual guide. Despite this, the Halo 4 terminals and Halo: Silentium portray Requiem as having a number of access corridors. It is possible that the other portals were sealed off with Requiem when the Didact was placed into stasis, likely as a safeguard against the Halos' activation. The aft half of the Forward Unto Dawn approaches Requiem. An enhanced view of the surface of Requiem in Halo 3. A view of Requiem in Halo 3 with added illumination. Original "Epilogue planet" concept art for Halo 3. The Forward Unto Dawn approaching Requiem in a teaser image for Halo 4. Requiem's entrance portals closing off near the end of the Forerunner-Flood war. Captain Andrew Del Rio observes Requiem from the bridge of the UNSC Infinity. The Forward Unto Dawn being pulled into Requiem in the Halo 4 announcement trailer. The Dawn and the Covenant remnant fleet in orbit around Requiem. The Prometheans' command center within Requiem. A rocky valley on Requiem. The first pylon in the core of Requiem. The second pylon in the core of Requiem. The UNSC Infinity crashing down on Requiem. John-117 observes Jul's Covenant forces approach the crash site of the Infinity. A dense jungle on Requiem. A cityscape of inverted spires, connected to Requiem's inner ceiling. A lava stream in the location codenamed "The Cauldron". The icy location codenamed "Fortress" on the primary shell of Requiem. The Forerunner structure codenamed "Control". The caved location codenamed "Cyclone". The Forerunner structure codenamed "The Gate". The location codenamed "The Refuge". The location codenamed "Two Giants". The caved location codenamed "Warrens". A caved location below "Harvester". The desert location codenamed "Sniper Alley". The location codenamed "Great Anvils". The desert location codenamed "Quarry". The Forerunner structure codenamed "Ravine". A solar power facility codenamed "Haven". The UNSC base named "Galileo". An unidentified location, likely near Apex or Lockup. Concept art of a cathedral. The portal entrance to Requiem. Early concept art of the Forward Unto Dawn approaching Requiem. The Dawn entering Requiem's interior. The Dawn's debris field floating near Requiem. Early concept art of Requiem, with floating boulders instead of spires. Massive Forerunner constructs inside Requiem. Finalized concept art of Requiem's interior. An early sketch of Requiem's inner ceiling. John-117's Pelican moving past a sea of inverted spires. A bridge connecting two ends of an open-air cavern on Requiem. Another exposed cavern on Requiem. A massive, partially-undersea battlement on Requiem. Early concept art of the shield world's ubiquitous spires. Finalized concept art of a spire. Two energy pylons inside Requiem's core. A Forerunner structure among rampant trees. A hallway in a Forerunner structure.